Savvy Auntie: And Then, I Was in Business. In the last post, I spoke about how I was lucky enough to connect with a number of entrepreneurs who welcomed me into a community of entrepreneurship. These were people who were years ahead of me in starting up their own business. And it was inspirational. But I also needed to connect with people who were just starting out; people just like me. This was part of doing whatever I could to keep moving forward with starting my own company. So within the first week, I was seeking all the ways I could invest in this company that was still in a very early period of conception. Very early. I got business cards. Not the freebies you can get on the internet either. I paid good money for really nice, modern, fresh looking business cards. Even though I didn't yet have a real business. Or a name for the business. Or anything that might look like I was in business. But I got cards. They said: "Auntie Melanie Notkin" on them. To anyone I gave the card, I was in business. I also went to a SCORE seminar. SCORE is a great national organization that supports young entrepreneurs by offering seminars and one-on-one counseling by retired experts. There were other people there just for the 'stick-to-it-ness' it offered. I wasn't the only one. I wasn't the only one! And then I joined a Ladies Who Launch Incubator program and met about ten women, just like me. Or at least like me in that they were starting their own company. Or thinking about starting their own company. Or thinking about thinking about starting their own company. Or just needed moral support for changing their life in some way. And with all my buttoned-up senior-level corporate experience, all the books I had read over the past decade or two, and a really good, solid idea, I needed moral support too. Boy, did I need it. I also needed to solidify the fact that I was in business. And the more I repeated that exact phrase when introducing myself, the more I repeated it when offering my business card, the more I repeated it by registering for a program, the more I believed it. I was in business. I was three weeks in. I was in business. And everyone and anyone who would listen, knew it. There was no backing out now. Because there were people out there who were three weeks behind me. They needed my moral support. They needed my advice. I told them to get business cards. And then they were in business too. And just like that, they were exactly like me. I love your story about business cards. How did you go about selecting the design for them? I wandered here through Alltop.com... Now I'm off to read the rest of your blog! Thanks for finding me, Carrie. I am glad you are enjoying my blog! 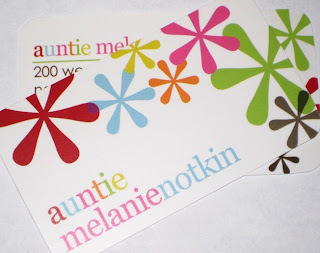 While my SavvyAuntie branded cards look much different now, the design for these cards is from www.erincondren.com. Erin, another woman entrepreneur, is an incredibly talented designer and her biz cards and stationary are really beautiful and sophisticated, yet modern and fresh. I asked Erin for some help when I was looking for an agency to design my future website, and she was incredibly helpful. I am happy now to throw some good karma back her way. Thanks again, and enjoy the Savvy Auntie Blog! Melanie, good point about the business cards. Having worked in Japan for many years where exchanging cards is an essential part of almost any meeting, I wouldn't think of not having some type of card with me at all times. I have a card for Singelringen (a product I represent), a card for Courage Group (my company), a card for Commercial Marine Biology Institute (I am on the board of this sustainable aquafarming venture). When I was at Blogger Social NYC in April, I noticed that several participants had separate cards just for their blog. To go separate with the blog or to integrate to an existing card is an interesting challenge. I am fortunate that my designer partner in Courage Group can produce all the good looking cards I want. High quality paper and printing is a must - but easy to find these days at reasonable prices.